Roses ball, garden ball glass with colored glass granules, decorating ideas for your garden. 1 cork for mounting is included! This roses balls or garden balls are each through their manual production, a real unique. From the liquid glass- melt, at approx 1150°C takes the glassmaker with the so-called glassmaker- pipe, something glass and rolling this into colored glass granules. After applying from the colored glass granules, shall with a needle in transverse direction drawn a pattern. Thus prepared, the hot glass is blown with the glassmaker-pipe into a wooden mold. Therefore one speaks of in form- blowing glass. Then must the glass ball in the so-called cooling oven and shall at 520°C overnight cooled slowly to room temperature. This is necessary to compensate for material stresses. High manual skills, a good sense of proportion and years of experience with the glass material are the basic prerequisite for the production of our high-quality glass articles. Unbreakable packaging send we our high-quality glass ware to our customers around the world. Roses balls as accessories in the garden are popular for over 1000 years. They decorated - then called "garden balls" called - the gardens and doorways of Roman villas and proclaimed the wealth of the owners. In the 13th century claim venetian glassmakers the glass balls have mysterious powers. They believed the happiness is always on the side the owner the "lucky balls" in garden. You should between herbs and flowers placed - spirits from house and yard chasing because it was believed, by the reflecting surfaces, will the "evil eye" distracted. The evil will cursed on the spot. It was believed Garden balls protect against lightning. They were also regarded as symbols of fertility. Long time it was usual, that one the eve of wedding, with glass balls the bride happiness in the new home wishes. In the Bavarian Alps served it as Grabschmuck in Holy week, or as resurrection- lights in the Easter period. Often, they have also a useful function as scarecrows, as so-called "Hawk balls", the protection of poultry before birds of prey. Thus have the colors of the glass balls always played a role. Red protects the love and faithfulness, green gives a rich harvest, topaz protects before injustice and war. By reading of the novel of Fontane "Stechlin" reveals, that the glass sphere at Stechlins Castle ramp is more or less a constantly recurring motif as an indicator of fateful developments... - so she was "Truth-telling ball". At the time of the Baroque, the balls in the Catholic churches of Bavaria as lights of resurrection perceived. Often they were filled with water, to reflect the light of burning candles. Therefore they were called "Light balls". 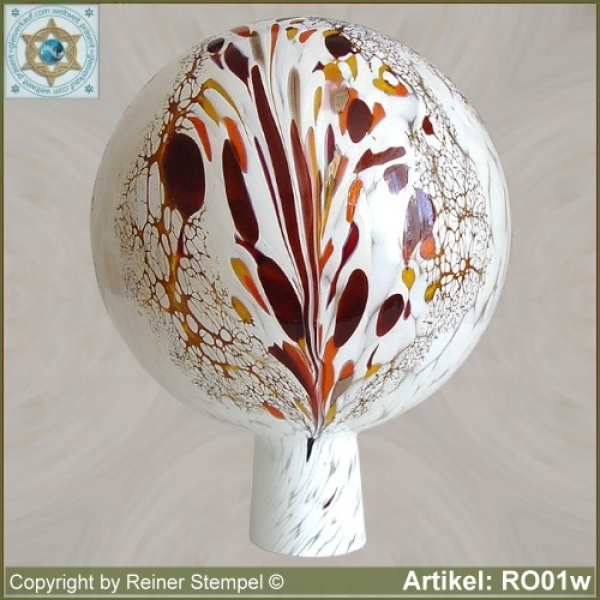 They were called "Rose balls" for the first time in the Biedermeier. According to legend, has in the Holy night on the run after Egypt, Maria found shelter under a Hazel bush before a thunderstorm. Therefore, are the garden balls - today still often - to find in Hazel bushes. They will also in the Bavarian Alps as grave decoration used and during Holy week, they symbolize the resurrection of Christ. As "Dream balls" called by King Ludwig II of Bavaria, they adorned his way to the Garden Pavilion to the castle mountain on lake Starnberg. In some regions, they are called "Hawk balls", because, they keep birds of prey from the garden and in cottage gardens are the chickens protected. Filled with wool or straw, they are a dark haven for certain beetles that eat pests. 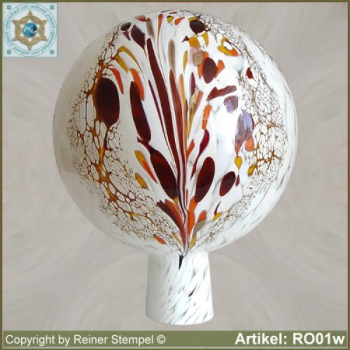 In the Feng Shui teaching, have the glass balls a protective effect for House and the people. You are able to distract unfavourable energies - yes strong negative influences bounce off formally by the round and reflective form of them.